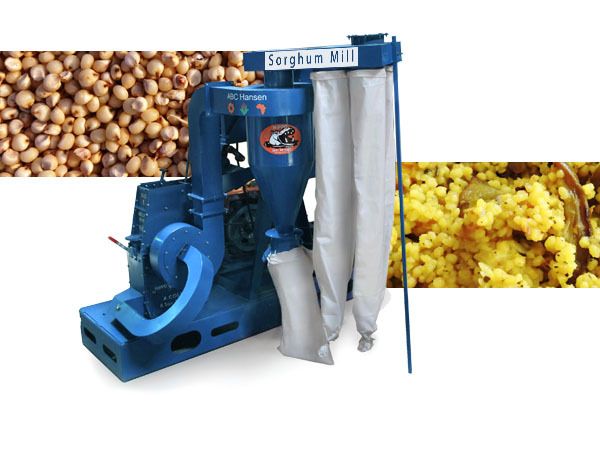 Sorghum flour may be milled with the Universal mill with plate application or a hammer mill application or any of the Hippo hammer mill range of mills. The flour is often screened after milling and the finer particles used for beer and the coarser portion used for porridge. Organic sorghum products can be milled with this exceptional equipment from ABC Hansen. It is always recommended that products be screened on an ABC Hansen rotary sifter prior to packaging for quality purposes if not for grading or separation purposes. It is likewise recommended that all grain products specifically, be properly cleaned prior to processing. The Quail II aspirator and cleaner separator with magnets to isolate ferrous material is supplied by ABC Hansen for this purpose. In some cases no warranty would apply on milling equipment if the product is not cleaned properly prior to processing as the milling and other equipment may be damaged.